WALES have a fine history of producing top-class strikers with John Charles ‘The Gentle Giant’ going down as perhaps the greatest. As Charles’s career was winding down, two came along as possible replacements. They shared a name and were born in the same year, and took somewhat similar routes to reach the top of the game. Ronald ‘Wyn’ Davies was born in Caernarfon in March 1942. 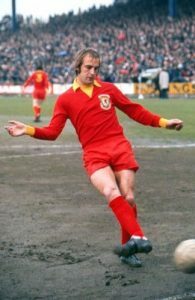 He was working in the slate quarries and playing for a local team, Llanberis before moving to Caernarfon where he played for the reserves alongside future Plaid Cymru leader Dafydd Wigley. During this period he was heavily scouted and went for trials with Manchester United, Everton and Aston Villa but all rejected the chance to sign him. After just a year with Caernarfon his potential to play in a higher grade of football was spotted again and he moved to Wrexham in 1960. The Dragons were then languishing in the 4th Division but Davies helped them to promotion in 1961-62 before moving on again. He had a choice of two clubs – Sheffield Wednesday and Bolton Wanderers who had both offered the asking price. The decision was purely geographical. Davies looked at the map, saw Bolton was an hour closer to his home than Sheffield and plumped for a move to Burnden Park. Bolton sold Dennis Stevens to Everton for £25,000 and bought Davies for the same figure. The move to Burnden Park, former home of one of his heroes, Nat Lofthouse, went well. He formed a formidable triple threat with Francis Lee and Fred Hill and the trio helped keep the Lancastrians in the top flight until 1963-64 when they were relegated. It was during his time with Bolton that Davies was first chosen for Wales and he would go on to pick up 34 caps for his country, scoring six goals including a classic header for Wales against England at Wembley. That strike for his country came shortly after he left after four years at Burnden Park, Thiis was the move that would establish him as a top-class centre-forward. 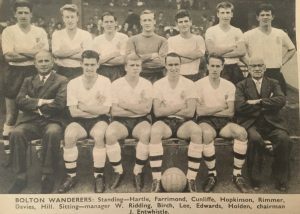 Newcastle United offered a club record £80,000 and Wanderers accepted. The move to the North East came after he impressed United boss Joe Harvey in an Easter fixture between the clubs. The transfer stalled initially with Davies asking for £70 per week, a figure Newcastle weren’t prepared to go to. Team and player eventually settled on a lower figure (around £50 per week according to sources) and Davies chose United over Manchester City. He says now it was: “The best move I ever made”. It was while at St James’s Park that Davies was regaled for the first time with a song he would become all too familiar with. A big hit at the time was ‘The Mighty Quinn’, written by Bob Dylan and made famous by Manfred Mann. Newcastle fans soon took this up, singing ‘Come all without, come all within. You’ll not see nothing like the Mighty Wyn’. Former Newcastle star Ivor Broadis, who turned to writing about the game after retiring once said of Davies; “If you could screw studs into his head, he’d be another George Best”. Yes, ‘Wyn the Leap’s’ aerial ability was second to none. Whilst never a prolific goalscorer (he would finish his career with a respectable though not remarkable total of 179 goals in 611 games) his heading prowess and the sheer amount of attention he took from opposing defenders allowed others to thrive around him. Albert Bennett and later and perhaps more memorably, Pop Robson were among those who took advantage of Wyn’s presence whilst at St James’s. It was at Newcastle that he enjoyed his most productive time, and secured undoubtedly his most famous victory. 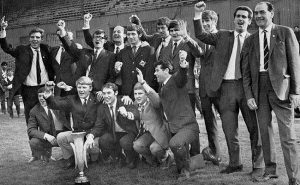 United were somewhat fortunate to qualify for the 1968-69 Inter-Cities Fairs Cup. 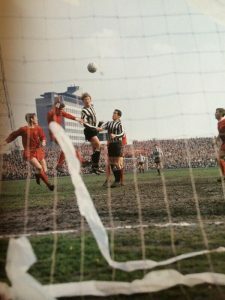 They had finished down in 10th places in the 1967-68 season but because UEFA insisted on a ‘one city – one club’ rule for the competition Newcastle qualified. There is no denying that, once in, Toon proved their worth in the competition. Feyenoord, Sporting Lisbon, Real Zaragoza (on away goals), Vitória Setubal and Rangers were brushed aside – with Davies bagging four goals in total – to set up a final meeting with Ujpest Dozsa of Hungary. Newcastle won the first-leg of the final at St James’s Park 3-0 with a brace from Bobby Moncur. But the skipper was also the unwitting cause of a Davies injury. As the team returned for their celebrations, 60,000 were waiting to regale their heroes and sing their praises. But ‘The Mighty Wyn’ was quickly whisked off to hospital to have his cheekbone reset. Club chairman Lord Westwood summed things up when he said; “Without Wyn Davies we would never have won the Fairs Cup”. Davies spent two more years at St James’s Park but in 1971 the club signed Malcolm Macdonald and it was time to move on. Over the next seven years he gave service to first to Manchester City who paid Newcastle £52,500 for him, and where he again lined-up alongside Francis Lee who once said of him; ‘He’s 2,000 times better in the air than me’,then to Manchester United,, Blackpool, Crystal Palace (on loan), Stockport County, and Crewe Alexandra before dropping down into non-league football with Bangor City. After a short spell in South Africa with Cape Town City it was time, at 37, to hang up his boots and he has since lived quietly in Bolton where he worked in the Warburton’s bakery for a while after retiring. 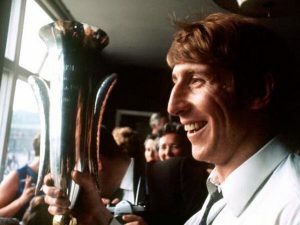 Next year will see the 50th anniversary of Newcastle’s Fairs Cup win. And despite some outstanding strikers pulling on the number nine shirt, none have been able to help the club to a major trophy. In that respect at least, St James’s Park still hasn’t seen nothing like the Mighty Wyn. Ronald Tudor Davies was born in Holywell, Flintshire in 1942. At school he played in the same team as future international teammate Mike England. Like his former schoolmate he went to Blackburn Rovers for a trial. 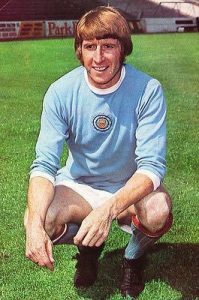 Unlike England, he was turned down and instead signed for Chester five weeks later and played for the club whilst also working as a steel moulder. Starting his career at Sealand Road mean starting out at the Football League’s lowest level, the 4th Division. Part of the training regime of Chester manager ‘Iron’ Bill Lambton involved jumping over hurdles wearing army boots. Davies would later credit this form of training with giving him extra strength when jumping for crosses. “When I took those boots off I felt like I could jump over the moon”. He would say years later. 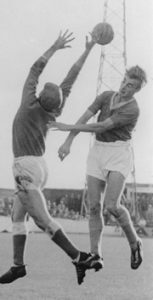 Davies made his debut for Chester as a 17-year-old late in a 1959-60 season when they would finish 5th from bottom in the 4th tier. The following year was even worse for the club as they finished bottom, and 92nd out of 92 in the Football League. For Davies however, the season was a personal triumph. In his first full campaign he found the back of the net 23 times for a team which only scored 61 goals. The following season Chester finished 93rd. But this was only because Accrington Stanley resigned their place in the league. They were still the bottom club and Davies was still scoring, topping the Chester charts again. He did suffer a poor spell early in the 1962-63 season and was dropped. When he was restored he scored four times in his first game back. Port Vale reportedly came close to signing him but instead he moved to 2nd Division Luton Town for a £12,200 fee having scored 44 times in 94 games for his first club. 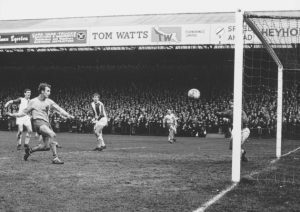 He continued finding the back of the net regularly in East Anglia, scoring 30 times in his first season to keep the club in the 2nd Division. Davies spent three seasons at Norwich and was as prolific as he was throughout his career scoring 66 times in 126 games. 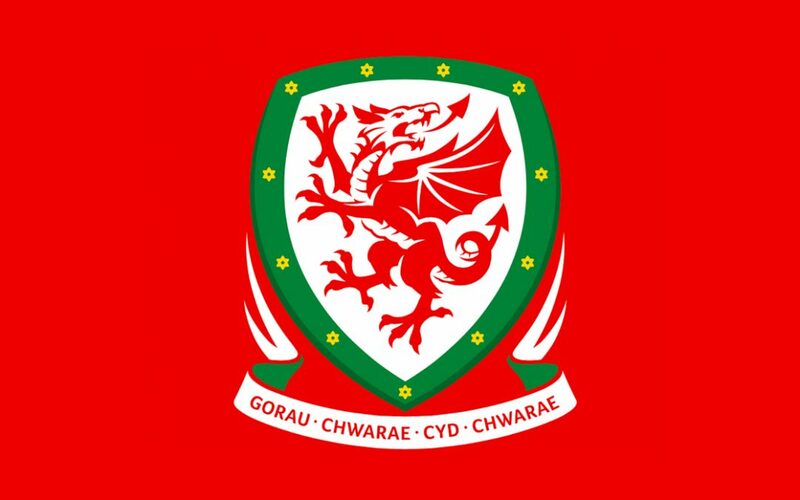 It was whilst with the Canaries that Davies received his first call up to the Welsh National team for a match against Northern Ireland in Belfast where he scored in a 3-2 win. He would go on to represent his country 29 times, scoring nine goals including one against England at Wembley where he soared above Jack Charlton to head home. In 1966, Southampton manager Ted Bates successfully bid a club record £55,000 to take Davies to The Dell and the offer was accepted, much to the disappointment of Canaries’ fans. Bates had first enquired about Chelsea’s Bobby Tambling but was put off by the £80,000 asking price and he decided that the Norwich man was better value. Southampton had finished runners-up to Manchester City in the 2nd Division in 1965-66 to be promoted to the top flight for the first time in their history. So for both club and player, it was a first shot at the big time. For Saints that first season competing at the highest level was all about survival. They managed that, finishing 19th of 22. And one of the main reasons was Davies. Playing alongside Martin Chivers, and with Terry Paine and John Sydenham as chief providers he finished as the 1st Division’s top scorer with a fantastic record of 37 goals in 41 games, including a run of 12 goals in 10 matches. During that excellent season Davies also put to bed any thoughts that he was a ‘one-trick pony’ as over two-thirds of the goal tally came from his feet. Soon after Manchester United manager Matt Busby, terming him ‘the best centre-forward in Europe, offered Southampton a bank-busting £200,000 for his signature. Bates turned him down and would continue to refuse all offers for his star man. In the following season he matched the feat of leading the league in goals although this time he had to share the top-scorer honours with George Best, the pair both scoring 28 times with Saints improving to 16th. Then Southampton took another step forward, finishing 7th and qualifying for Europe although this time their striker ‘only’ managed 24 goals. 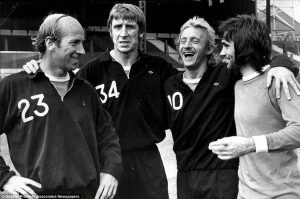 At the start of the 1969-70 season Southampton lost their first two matches, against West Bromwich Albion and Wolverhampton Wanderers, and then travelled to Old Trafford to take on Manchester United. 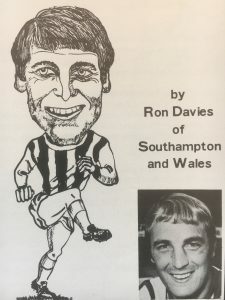 Willie Morgan gave the home team the lead but then three crosses from John Sydenham were met at the far post by the head of Davies (teammate Mick Channon said of the Welshman; ‘he could head the ball harder than I could kick it) and it was 3-1 Saints. Late on Frank Saul launched a counter attack and the centre-forward scored his and his team’s fourth to complete a remarkable win. 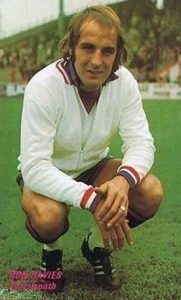 That season saw up-and-coming youngster Channon, who Bates brought into the side after allowing Martin Chivers to leave for Spurs for £125,000, top the scoring charts for Saints in a disappointing campaign in which the club dropped back down to 19th and were eliminated from Europe at the first stage. 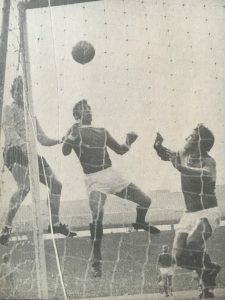 The 1970-71 season saw Davies back as top scorer with 21 as the team rose back up to 7th and again qualified for Europe (which would once again end at the first hurdle). Whilst he was good with both head and feet, Davies was also decent with his hands. He spent much of his spare time drawing caricatures of teammates and opposing players and these featured in the popular magazine ‘Goal’ during the 1970s. With opposing teams working out that the best way to stop a prolific header like Davies was to play the man rather than the ball, the goals started to slow and the injuries started to grow. 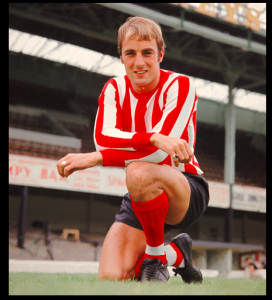 In 1973 he made the short move along the south coast to join Portsmouth, having scored 153 times in 281 outings for Saints. Then a year later he finally got that move to Manchester United, going north in a swap deal of veterans that saw George Graham head to Fratton Park. 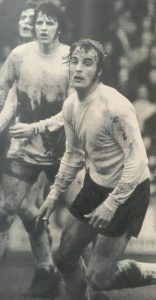 Davies made only eight starts for United and after a short loan spell at Millwall he crossed the Atlantic and joined Los Angeles Aztecs to whom he had been recommended by George Best. 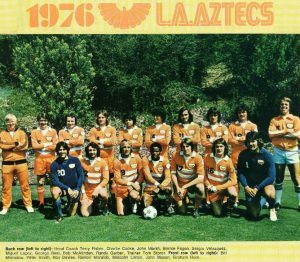 He spent three years in LA then moved on to Tulsa and Seattle before hanging up his boots at the age of 38 in 1980 and moving into coaching. He eventually settled in Albuquerque, New Mexico where he worked in the construction industry. In 2006 it was revealed that Davies would need a pair of hip operations and Southampton and Norwich fans got together and, with help from the Welsh FA, staged events which raised the money for these to be carried out. Davies, whose younger brother Paul played for Arsenal and Charlton Athletic, passed away in New Mexico in May 2013. 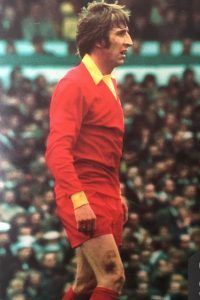 Regaled by former teammate Terry Paine as; ‘the best in the air I’ve ever seen’, Davies might have made a bigger impression nationally, and even internationally, had he moved to a glamour club earlier in his career. Southampton fans, who used to sing ‘Ron is King’ in praise of their hero, are eternally grateful that he didn’t.